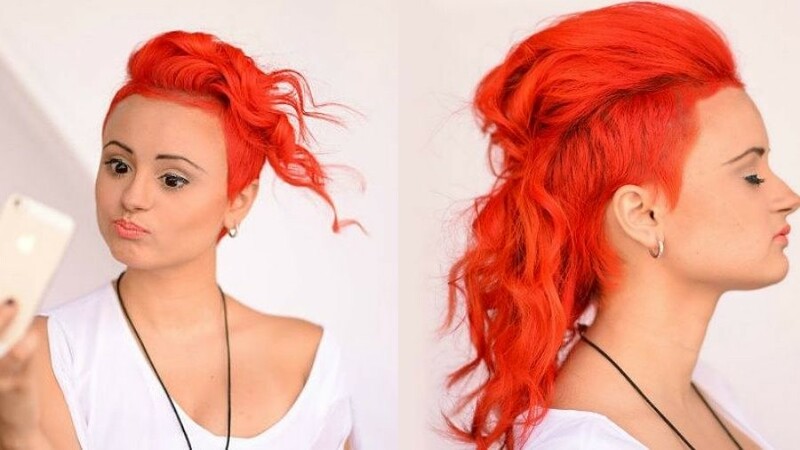 Hair stylist Crystal Lake took the trend to the next level with this Sunset Orange shade that she crafted in our color lab. That’s right ladies, this hot orange is carefully mixed and rumour has it that Crystal added four different pigments to concoct this delicious hair color. Marco designed a daring hairstyle with many styling possibilities. A good haircut goes hand in hand with hair color. And let’s not forget makeup artist JV Galindo, who always creates his makeup to accentuate and complement your style. The best part? This neon shade is semi-permanent and interchangeable with other tones. Just let it wash out. It will fade into soft pastel. Two colors for the price of one. Want some too? Make an appointment with our top-notch hair colorists and pick your candy hue from our color lab, or let creative stylists play with their ideas and come up with a brand new you! To preserve color, shampoo less, condition more. Use a dry shampoo instead, when your hair feels oily. If you have the urge to wash it, skip the actual shampoo, rinse and condition. Use a leave-in conditioner for extra protection. Deep condition once a week. Use a heat protective primer, if you blow your hair dry. Redken’s Pillow Proof dry shampoo is a favorite among stylists. It refreshes hair instantly by absorbing the oil in your hair and can extend the time between shampoos. Best part? It adds great volume and texture. A lightweight leave-in conditioning spray that detangles and protects your hair. Great for all types of hair, but excellent for fine hair that is prone to damage, because it protects, without weighing hair down. This primer makes the list of best hair styling products and goes on hair before any other styling products. Use it and it will protect your hair from heat up to 450 degrees and cut blow dry time. Wash your hair once a week and use a deep conditioning treatment. It will nourish your hair and keep your color shiny, fresh and vibrant. Great for colored hair with high porosity.